After the launch of Google+(Google’s new social network), Google recently lunched a cool new service where you can liberate all Google data of associated with the your Google account. That means you can download your all data inside zip archive of different kinds of Google products/services so that you can make backup of your Google contents. This service is named “Google Takeout“. Currently Google takeout supports for Buzz, Contacts and Circles (of Google+), Picasa Web Albums, your Profile, and Stream (also part of Google+) and more products are coming soon. Don’t forget that Facebook also let’s you download your all profile data. Google takeout is brought by an engineering team at Google called “Data liberation front“. The purpose of data liberation front is to make your personal Google data portable and let you takeout or in whenever necessary. Because Google now things liberation of your personal data at Google is very important and that’s why Google’s data liberation team makes it easier for you to access you data. 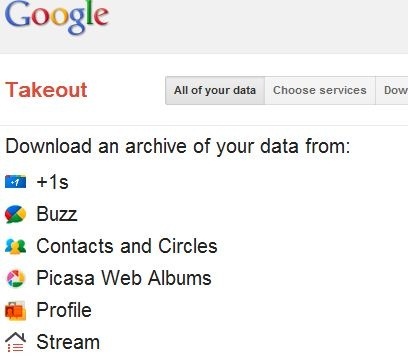 To download your all Google data or data of certain product, go through Google.com/Takeout . At the “All of your data” tab, you can download your all Google product data by clicking on create archive. Google will calculate the size of total data and show it before you download the zip archive. Or you can also download archived contents of specific products from “Choose Services”. So I also want to give thanks to Google and Data liberation front to give us opportunity to download our Google products data within seconds with one click. Nice information.just you can see about Google One Pass . It is a payment system for the Blog/Website Publishers to make money from their digital content by setting up terms to access their content. It offers purchase-once, view-anywhere functionality, so users can view the content they buy across all of their devices including mobile devices. journal daily. I’d like to start a blog so I can easily share my personal experience and thoughts online.